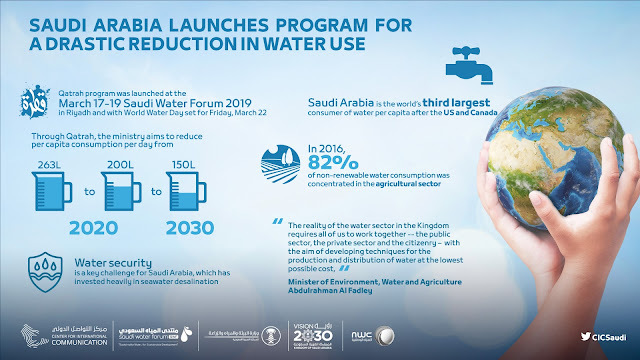 Saudi Arabia, one of the world’s driest countries, has announced a national program for rationalising water consumption in the Kingdom, setting ambitious targets that include slashing usage by nearly 24 percent by next year and some 43 percent by the end of the next decade. The announcement came at the Saudi Water Forum 2019, held this week in Riyadh, and with World Water Day set for Friday, March 22. Speaking at the March 17-19 Forum, Saudi Minister of Environment, Water and Agriculture, Abdulrahman Al Fadley, officiallylaunched the Qatrah (Arabic for ‘droplet’) program, aimed at reducing water consumption as part of the ministry's efforts to attain water sustainability, along its official website (www.qatrah.com) and social media accounts. Citizens can pledge to conserve water by registering on the site. Water conservation is far from just a Saudi issue. World Water Day 2019 falls on Friday March 22 and was created to highlight the importance of freshwater and to advocate for the sustainable management of freshwater resources. The internationally recognized theme this year is 'Leaving no one behind'. A number of government ministers and senior officials in the water sector from inside and outside the Kingdom attended the Saudi Water Forum, which is being held under the theme "Sustainable Water for Sustainable Development" and intends to shed light on the efforts and future directions of the water sector, according to Vision 2030 and National Water Strategy. “The reality of the water sector in the Kingdom requires all of us to work together -- the public sector, the private sector and the citizenry – with the aim of developing techniques for the production and distribution of water at the lowest possible cost,” Al Fadley said.